Isn’t this such a cute little dish? It’s a baked egg in a ramekin. Yes, I have been obsessed with cooking things in ramekins lately 🙂 I had one egg left at home and a ramekin staring at me so of course I decided to cook it in there. This is a really easy recipe. For the basic ingredients, you just need egg, butter, salt & pepper. 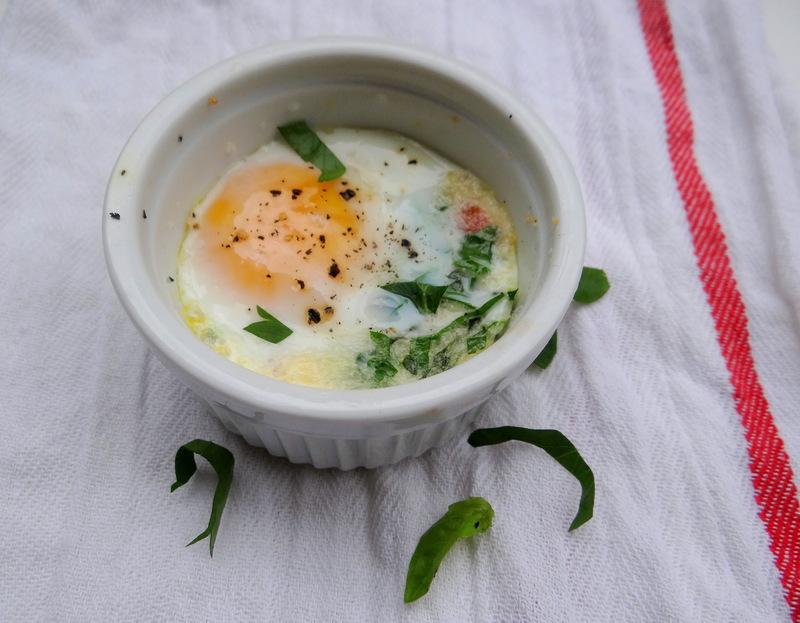 Simply butter the ramekin, add cheese & tomatoes & crack an egg on top! You can add other ingredients as you please- different cheeses, mushrooms, onions, ham. There are some recipes out there that call for heavy cream but I didn’t have any and thought it tasted fine without it. Next time, I am going to play with a variety of ingredients and add different things to each ramekin! 6. Place ramekin on top of baking pan and bake in oven for about 15 min until the egg white gets soft. 7. Sprinkle more cheese or herbs if desired & eat!